Accidents happen. Yet when they happen to a business person, especially an entrepreneur, they can have an impact on the company’s bottom line. If you have found yourself in a situation in which you can’t work, here are some ideas to help you keep your business forefront in your customers’ eyes. Stress management professional Hasan Riza Gunay came to the United States on a fiancé visa. Stripped of his ability to earn money by U.S. immigration regulations for at least two months after his wedding, Gunay grew restless. He became a prime candidate for his own services. He–Turkey’s first and only stress coach (he holds a patent for his title and methods in his homeland)–needed a way to face the challenges of his own stress and to promote his work even while he couldn’t earn a dime. Together with his fiancée, a copywriter, Gunay began an outreach program to the stressed-out population of the county. Wearing his promotional T-shirt, which reads simply, “Stress Coach” (“Stres Koçu” in his native Turkish), he introduces himself to everyone he meets, his infectious smile and European manners winning over even the coldest longtime residents. Business people whose personalities aren’t as outgoing as Gunay’s may do well to recruit friends, relatives, and customers who do have sparkling personalities to serve as brand ambassadors, doing the footwork to promote the business even when the business is temporarily out of commission. Gunay isn’t one to sit still. He sought out charitable organizations in which he could conduct group activities that could help underserved people to relieve their stress. 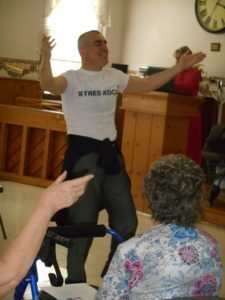 Recently, he brought down the house at the Golden Age Retreat, the county’s assisted living facility. With upbeat Turkish music, Gunay performed traditional Turkish dance moves, encouraging the chair-bound residents to move their arms to the music so they could get some stress-relieving exercise. Not only did they move to the music, but many residents also clapped and hooted with delight when Gunay’s performance veered into Elvis territory. After the performance, Gunay served the residents healthy Turkish snacks and circulated among the people. One could see the stress melt away from their faces. Business people who move to a new country may not be able to find paid work in their chosen field right away, but they can perhaps donate their services to those not so fortunate, creating positive buzz about a brand and a business. As for Gunay, he also spends a part of each day forging new relationships with Americans through social media. He joins local Facebook groups, groups for new immigrants, physical fitness groups (getting exercise is one of the best stress relievers out there) buy-sell-trade groups–groups of people who may need his services in the future. Even when business people have been sidelined with an injury or illness, they still can promote their business through social media posts. Making the business a topic of conversation on social media can expand brand awareness, even when the business is not yet operational. He uses his time to plan future ventures related to his main profession: a personal chef business that specializes in healthy, stress-relieving Turkish food, designing group fitness classes that feature his homeland’s upbeat music and dance moves that help people get fit and feeling well without feeling like they’re in a “workout.” By the time he gets his work permit, he’s already laid the groundwork for not only private sessions but also group sessions and side ventures related to his main job. Other businesses who find themselves with down time can also use the time to create expansion plans that can extend the range of services they offer. A new potential customer base means more opportunities to expand brand awareness among those who might otherwise have not heard about the business. Gunay also writes slogans and brochures that promote his work to his future target market. With the help of his fiancée’s translation and copywriting skills, the materials spread his brand message to a new, American audience. Blog posts, business cards, promotional T-shirts bearing Americanized slogans, and labels for related products Gunay can cross-sell are all in his future plans. Building buzz about a launch of a new business (or a relaunch of a business which has been out of commission for a while) creates a sense of expectation about the launch in prospective customers. 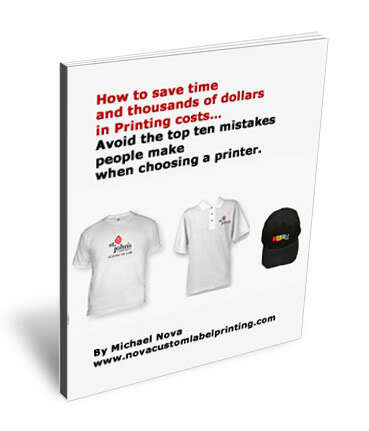 When people see the business owners (or their customers) walking around in the company t-shirt, potential customers, hungry for their services, ask questions. Brand awareness grows–even if the work is on hold. If a Turkish logo can capture the attention of passersby, just imagine what promotional wear in plain English could do to promote a business–even if the business is out of commission for a while. Anticipation, teased out with savvy publicity, can become one of the most powerful marketing tools in a business’s arsenal. If you would like to learn more about Gunay, you can contact this stress coach here.